When it comes to buying a 110cc Dirt Bike or 110cc Pit Bike to trust with your life; WHO you buy from is just as important as WHAT you’re buying! Please CLICK HERE to understand why. Our 110cc dirt bikes for sale (you might call them 110cc pit bikes) are top-of-the-line dirt bikes designed to reach up to 50 MPH and get more than 130 MPG. That’s a whole lot of mileage, full of tons of fun, for just a little bit of gas! These totally inexpensive and affordable (but not cheap) 110cc dirt bikes for sale are perfect for any rider looking to have some fun out in the back country or out on the dunes. Weighing in at about 150 lbs, these 110cc dirt bikes are light enough to be picked up by two people with no problem and they are compact enough to be easily loaded into the back of most SUVs. Take them on all your future family vacations, long weekends, and getaways! Although small in stature, our 110cc pit bikes for sale pack a lot of power - the indisputable standard in terms of weight and rideability. Our 110cc dirt bikes are great for demanding trails or more challenging off-road adventures, as well as just riding around on the farm or in the backyard. In the selection of 110cc Dirt Bikes below, you’ll find our most popular sellers from; Roketa Dirt Bikes, SSR Dirt Bikes & Ice bear Dirt Bikes, which all have a proven track record for safety, quality and performance. We ‘cherry pick’ the very best models from all our vendors’ product lines, which come fully assembled, for the best price online. For you dirt bike lovers who are forever seeking a little bit more, in addition to our 110cc dirt bikes for sale we also offer 125cc dirt bikes, 200cc dirt bikes and 250cc dirt bikes. 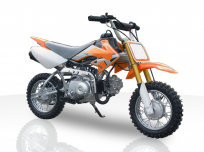 If you are looking for some dirt bikes for the little ones in your family, you should also consider our 70cc dirt bikes. Joy Ride Motors is truly the one-stop shop for all your riding needs (including motorcycles and scooters too)! If you ever have any questions about our motorcycles, dune buggies, electric bikes, scooters, go karts, trikes, or dirt bike selections, please do not hesitate to call us. We are the experts and are more than happy to answer any and all of your questions. Help is just a simple phone call away. You can easily contact one of our well-informed staff representatives today toll-free at 877-300-8707. Joy Ride Motors' 110cc dirt bikes for sale are an amazing value that is inexpensive but not at all cheap!